Christopher Jason Stafford (No.62 in the list of male British team members) was born in Leicester on 7th July 1972. It wasn't a foregone conclusion that he would become a roller speed skater, but his pedigree certainly suggested that it was likely. His father was Cliff Stafford, the National Team Manager of New Zealand when they won their first World Championship in 1960. Cliff also went on to be Chairman, then later President, of both Mercia and then latterly the Birmingham Wheels Club - the most successful speed club in British skating history. In addition to that Chris's uncle, Dennis Stafford, had been an international speed skater having represented Great Britain at the 1958 World Championships in Finale Ligure, Italy. So, Stafford junior was well positioned to give racing a go too. Stafford regularly trained with his father and uncle at the Granby Halls rink in Leicester but it wasn't until he was 14 that he decided to enter his first race. On 7th March 1987 at the Rollerworld Rink in Derby, Stafford stood on the start line for the very first time. His performance was nothing worthy of note but he had certainly got the bug. As fate would have it, amongst the crowd of spectators was another youngster who upon witnessing the series of races that evening was also inspired. A year later he would take to the track himself and over the course of a decade would go toe-to-toe with Stafford as each tried to establish himself as the number one skater in Britain. That youngster was Sutton Atkins but those battles were still some way off. Stafford had started racing when the Category system was in full swing and age group races were few and far between, generally only being held during British Championships. He started his racing career in Category 5 but by the end of his first season had progressed to Category 4. He was a regular medallist in this category and was knocking on the door of Category 3 throughout the 1988 season, but his attendance at race meetings was sporadic to say the least, as was his training. Skating to Stafford at that time was more of a hobby than an ambition to be successful. On 3rd July that year, just a few days before his 16th birthday he took part in his last junior event, the first ever Indoor British Championships. The Championships were held on his home track at Granby Halls and Stafford secured himself a bronze medal. A few weeks later and he was elevated to Category 3, but his 8th and 10th places in the two events showed him that success is not something that can be taken for granted. It was a time of change for Stafford and having just left school meant that his priorities in life were also changing. Despite this he maintained his training and had a solid winter but it was to be a day short of a full 12 months before he stepped onto a track again competitively. His absence meant that he was relegated back to Category 4, but not for very long. 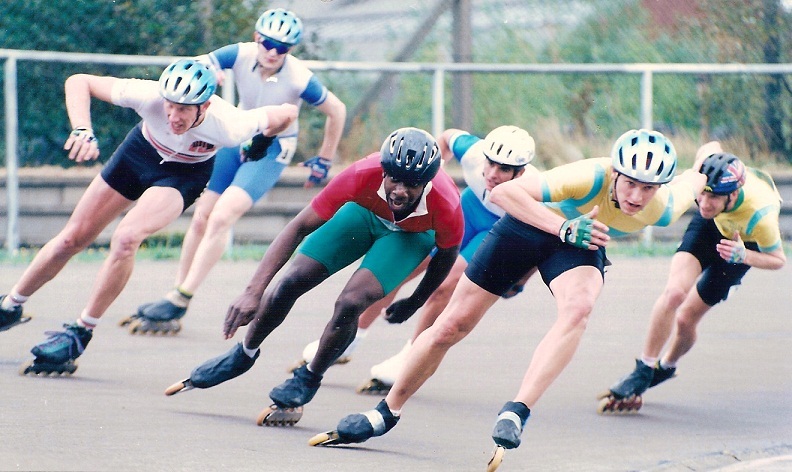 On 20th August 1989 he won his first race, a 3000 metres event at Roller City, Southend. His next race found him once more elevated to Category 3 and this time he was amongst the medals. Suddenly Stafford had started to get himself noticed. 1990 was his first full season of racing. Stafford was a member of the Birmingham Wheels club and not only was he coached by former European Champion and world medallist John E. Fry, but he was also benefitting from having a strong team of other youngsters around him to bring him on. The likes of Simon Davis, Andrew Lyndon, Chris Ampaduh, Rob Shemsan and Nick Palfrey were all strong and talented skaters in their own right, but the group not only skated together, they grew up and enjoyed life together. The result was a formidable nucleus of youngsters who would each put themselves on the line for one another every time they stepped onto a track. By the end of 1990 Stafford was in Category 2 and by mid 1991 had won his first Category 2 race. In 1991 Stafford would take his first British Championship medal, a bronze in the relay. A few weeks later saw him again 3rd in the Northern and Midland Counties Championship behind team mates Nick Palfrey and Andrew Lyndon. Shortly after was yet another bronze in the Open Handicap Championship, the Jesson Cup. He started the 1992 season still in Category 2, but on May 31st and a few Category 2 wins later saw him finally reach the elite group of Category 1. Three weeks on from his first Category 1 event came the British Championships on his home track, Birmingham Wheels. The weekend of the 20th and 21st June 1992 will be remembered for many things: Sutton Atkins winning his first (and second) British title; Stafford's former team mate Chris Ampaduh (now skating for Northampton) winning his first British title; John C. Fry winning his first British title and Tony Marriott winning his last British title. The latter two are not so memorable in themselves but more the manner in which they were won. Fry's victory on the second day in the 5000 metres came about by an excellent display of team work of which Stafford and fellow Birmingham Wheels skater, Simon Davis, were instrumental in controlling the pace with such a speed that nobody could or wanted to attempt to pass. Following on from that success the next race, the 20000 metres, was set up for Stafford to win and the group of Fry, Davis and Stafford set out to repeat the tactic. However, as Davis moved over on the last lap to leave Stafford at the front, North London's Tony Marriott came between the pair of Birmingham skaters grabbing Stafford as he did so. The result was that Stafford stumbled and could only skate round for 4th place. Marriott's victory was controversial in so far as it was his mother, Gwen Marriott, who was the bend judge where the incident took place. In fairness, whether grabbed or not, Stafford was still probably some way short of being ready to take a British title and Marriott. despite being out of form, had shown the determination it sometimes takes to get the victory you desire. Throughout the rest of the 1992 season Stafford started to come into his own. His results were beginning to see him consistently in the top four or five, but more importantly there was a change within the sport on the horizon that would see Stafford take full advantage of and really emerge amongst the elite. That change was inlines. 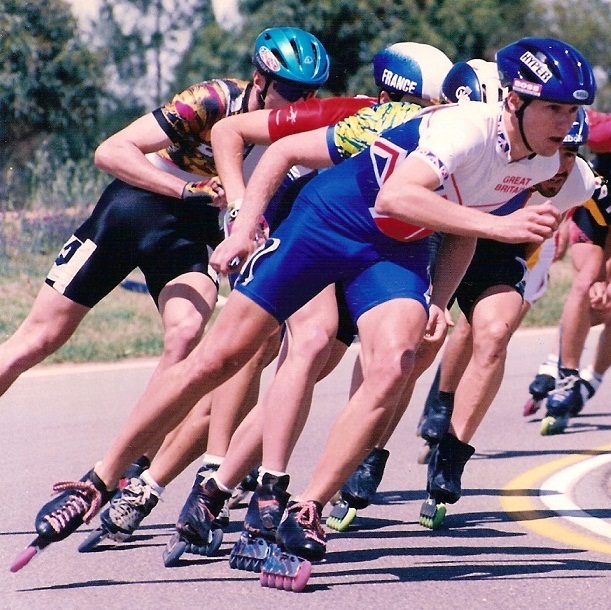 During the 1991 World Championships a chance witnessing by John E. Fry of Doug Glass (USA) rolling around on a pair of inlines prompted Fry to ask Glass what it was all about. Glass replied that it was all the rage in the States and that very few races were now done on quads. As soon as Fry stepped back onto British soil he was making moves to get his skaters onto inlines, and this of course included Stafford. For Stafford, the transition from quads to inlines was not so difficult as it was for some of the others. His father was not only an accomplished roller skater but he had also been heavily involved in ice speed skating with the Nottingham club. The technique on inlines was not too dissimilar to ice skating, and years spent on Nottingham's ice rink meant Stafford adapted to the new type of skate very quickly. Despite inlines being allowed in some races for the first time at the 1992 World Championships, the British Federation were slow to respond to the change and only held one or two "exhibition" races back in the UK. It wasn't until the 1993 season that Britain started to embrace their introduction, but even then this did not include the British Championships, with the exception of the Marathon. 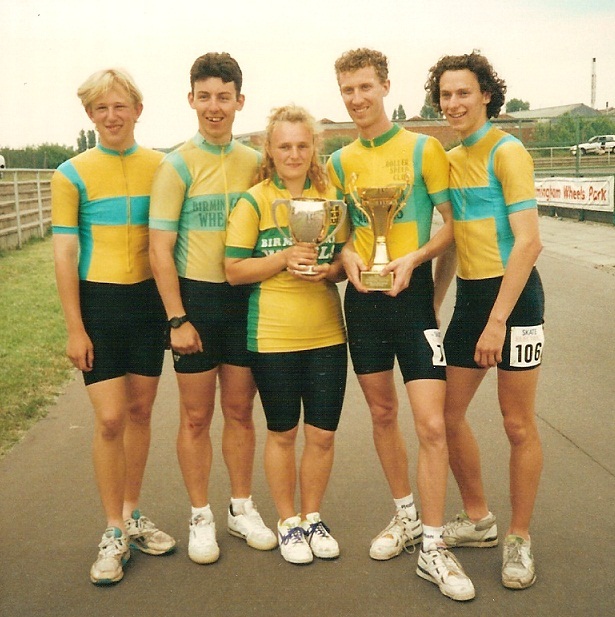 For Stafford, of the 30 races he entered in 1993 he would finish in the top five in just under half of them, but this was still not enough to see him selected for the World Championships in Colorado Springs, USA, in September. 1994 was a turning point for Stafford. In the first 6 months of the new season he only finished once outside of the top 4, however, when the British Championships came around in July he could only manage a highest position of 4th place in the 20000 metres. When the team for the European Championships to be held in Pamplona, Spain, was announced his name was not amongst them and it was Stephen Walker (Fenland) who would get the final place having taken bronze just ahead of Stafford in the 20000 metres British Championship. It was a blow for Stafford, but his rejection was to be short lived. Two weeks on from the European Championships was the World Championships in Gujan Mestras, France, and this time Stafford was amongst the British contingent with Walker having been dropped. It was the start of an international career that would see him compete for Great Britain across the globe for the next 13 years! Also on the team in 1994 was Sutton Atkins. 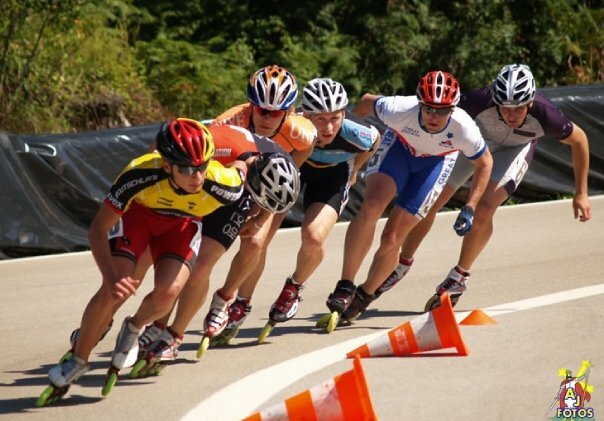 By now Atkins was a well established speed skater with numerous British titles under his belt and having had his first taste of international competition back in the 1990 European Championships in Inzell, Germany. Atkins was a controversial figure back then. To some people he was arrogant and egotistical and did not endear himself to the establishment, but to others, especially his own Derby contingent, he was a model of excellence. Whichever side of the Atkins fence you sat on there was no doubting that he was good. In fact, not since Tony Marriott had anybody been so dominant domestically. Stafford, by contrast, generally played second fiddle to Atkins. Whilst both were capable of winning races, it generally tended to be Atkins that came away with the spoils, especially where British Championships were concerned. Internationally it was not so clear cut. Back home it was generally a two horse race between Stafford and Atkins, but internationally when there were other class skaters and factors involved it was very much the toss of a coin as to which of the pair came out on top. (The only real exception to this was the 1996 World Championships in Scaltenigo and Padua, Italy, where Atkins hit form and was in a class of his own as far as British skaters were concerned). As the battle for bragging rights continued between the two skaters so each began to get under the other's skin and in 1996 the two came to blows - literally. On 8th December 1996 at a track on an indoor karting circuit in Derby, a series of six close races saw Stafford and Atkins again pitted against each other. By the end of the schedule there had been bumping, barging and disqualifications which spilled over off the track. For the altercation that followed both skaters received reprimands from the national federation along with suspended bans. Over the next few months all went quiet between the two, but very soon the lid was lifted off once more. The two skaters continued to battle it out on the track through the early part of 1997 but as the British Championships arrived emotions once again ran high. Stafford was still to win a title but Atkins, having now won several, was working for team mates to share in the spoils. However, in the 5000 metres he was adjudged to have fouled Stafford causing him to fall badly. The result was that Atkins would be disqualified and receive an outright ban. It was a sickening blow for Atkins having superbly qualified for the World Games from the 1996 World Championships, but the ban meant that he would miss out on the opportunity to compete in this possibly once in a lifetime event. Recovering from his fall, Stafford was once again selected for Great Britain at both European and World Championships. In fact, he was the country's only representative at the World Championships in Mar del Plata, Argentina, becoming the first sole British athlete to attend a major Championships on behalf of Great Britain. The following year things had calmed down between Atkins and Stafford and the pair resumed their less physical, but no less competitive battles. Together they would make up the British team for the 1998 World Championships in Pamplona, Spain. It would be the last time the duo skated together internationally as yet more "run ins" with the establishment and another ban for Atkins, this time for an excessively draconian five years, effectively ended his international skating career overnight. Stafford, however, went on to make the team for Great Britain at both European and World Championships continually for the next six years taking him to Venezuela, Chile and of course all over Europe. His only break during that time was for the World Championships in Colombia in 2000 when the British Federation decided not to send a team on advice from the Foreign Office. It was felt that the security of the athletes could not be guaranteed and therefore Britain boycotted the event - as did France. In hindsight it was probably the wrong decision and Stafford, himself, was disappointed at not having another crack of the whip, especially it being in Colombia where the atmosphere was known to be electric and the sport enjoyed by literally thousands of frenzied spectators. In 1999 Stafford finally achieved one of his main ambitions by finally becoming a British Champion. On October 24th he won the British Marathon Championships at Chesterfield ahead of Chris Orgill (Ratae). His first individual medal was back in 1995 but this was his first individual gold. At 27 years of age few people thought that he could win many more titles after that. It was a fact that Atkins was not present during his first victory, nor any of his subsequent victories for that matter, but that didn't stop the young proteges of Atkins going all out, not just to beat Stafford, but on occasion to try and humiliate him. What people tend to forget is that Stafford was pretty much a lone skater for many years. His young Birmingham Wheels team mates of Lyndon, Davis, Shemsan and Palfrey had long since gone their separate ways. Even his best friend and training partner John C. Fry had hung up his international boots some four years earlier, as had British Champion and international Ian Ashby. Faced with this, in 1997 Stafford approached a sponsor, Kryptonics, and decided that he could benefit from racing for them. Still coached by Fry Senior, Stafford was now the sole skater for one of the first factory sponsored clubs - Team Kryptonics. Whilst the likes of Team Hyper Wheels and latterly Salomon UK were all establishing themselves as collective forces to be reckoned with, Stafford had to take them on alone. Despite the odds being constantly stacked against him Stafford regularly came through, so much so in fact that between 1999 and 2007 he amassed a total of 24 individual British titles and 12 British team titles over all distances. In that time he also won the Overall Men's title on no fewer than four occasions. His individual tally ranks him third in the all time list of British Men's Champions. In 2001 his efforts were recognised by the Birmingham City Sports Council when he was nominated for an individual award for his international achievements. Stafford was runner up on this occasion but it was still a fantastic accolade for him as the award was rightly presented to Olympic heptahthete and gold medallist, Denise Lewis, for her winning performance at the Sydney Olympics the previous year. In 2004 his European Championship performance in Heerde, Holland, was pretty lacklustre and Stafford withdrew himself from selection for the national team for the forthcoming World Championships. At 32 he was starting to now ask himself questions about his realistic chances of ever winning an individual international medal. Whilst he continued to race and win domestically he chose also not to be considered for selection in 2005. In that year, his father, Cliff, had fallen ill and had been diagnosed with cancer. Stafford, being an only child decided that there were priorities outside of skating that needed his attention. The following year, however, he decided to give it another shot. Still one of Britain's elite Stafford once more found himself in a British skinsuit and competing for his country, but in all honesty his mind was regularly elsewhere. Whilst at the World Championships in Anyang, South Korea, Stafford got a call he was dreading. His father had taken a turn for the worse and he should come home immediately. Stafford's Championships were cut short and he returned home to be with his family. (Cliff eventually pulled through his latest battle but sadly finally lost the fight on 8th June 2008). In 2007 Stafford knew the writing was on the wall, certainly internationally. But the World Championships were going to be in Cali, Colombia and the thought of competing in the one country he so wanted to compete in was the spur he needed. That year he made a point of going out with a bang and at the age of 35 won his last three individual British titles. Since his retirement from international skating he briefly kept his hand in domestically and on occasion found himself on the top step. But his appearances became less and less. His last major achievement was to help his fellow Birmingham Wheels team mates Vincent Henry and Michal Roman win the 2011 British Relay Championship. Then later that year, on 18th September aged 39 he set foot onto a track for one last time. Finishing 6th overall in a Birmingham Wheels Category 1 race, Stafford knew his time was well and truly up. Stafford's highest individual placing in a World Championship was 13th. On paper this looks fairly unremarkable, but Stafford was a part-time skater with a full time job in an era when professionalism was the only way anyone could realistically be a world beater. The days of skating as a past-time were well and truly over. Domestically, with no fewer than 36 British titles to his name, there are few skaters who are above him on any list. Having been selected to compete for Great Britain in 20 World Championships and 24 European Championships there are NONE above him. His international career spanned generations. He was there when Chad Hedrick won his first and his 50th world title. 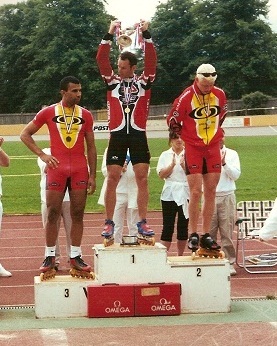 He raced back in the 1990's with the likes of Marco Giannini and latterly in the 2000's with the likes of Joey Mantia. To summarise the career of Chris Stafford on a web page is a task in itself. To sum him up in three words is much easier. British Skating Legend.